Notes: The Sea Fan is peaceful, but it should be given adequate space away from neighboring corals and anemones. Underwater epoxy is commonly used to anchor its base to a piece of live rock in the reef aquarium. It is more challenging to maintain this species because they are non-photosynthetic and they require supplemental feeding several times per week. In order to inhibit algae and cyanobacteria growth, it is important that this gorgonian is provided with a medium to strong, constant or intermittent water flow. If in the event that it does begin to become covered with algae or cyanobacteria, remove it from the coral immediately, as this will cause rapid tissue deterioration. Algae can be removed gently with the use of a soft brush; combat cyanobacteria by soaking the coral in freshwater of the same temperature for approximately 1 minute. These corals will also benefit from the addition of iodine, calcium, strontium, and other trace elements to the water. I love mine. It is so beautiful when opened. 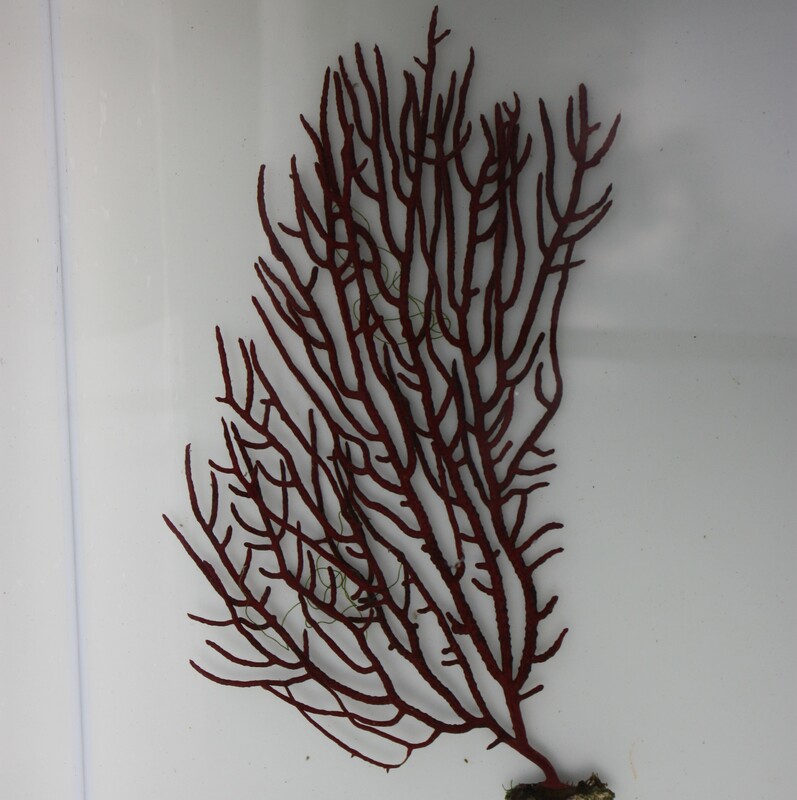 The sea fan arrived in pristine condition. It adds such a nice color to my aquarium. Love the deep red! My new pair of seahorses tend to love it as well. It was packaged well very and my entire shipment arrived smelling "fresh", which might sound strange but when ordering live fish and live plants, a fresh smell is always welcome! Thanks, again, to the wonderful staff at Salty Bottom Reef Company for providing me with healthy, beautiful things from the sea. Q: What is the size of the fans you ship? A: They range from 6" to 12" the full gorgonian. They are not little pieces of gorgonians you find elsewhere. Q: Do you have to glue it to liverock before putting it in tank?